(4) Subrules (1) and (2) are subject to rule 78.06, which provides that in certain circumstances the registrar shall make an order dismissing the action as abandoned. (5) Subrule (4) is revoked on May 6, 2008. 2. Rule 24.1.01 of the Regulation is amended by striking out “establishes a pilot project for mandatory mediation in case managed actions” and substituting “provides for mandatory mediation in case managed actions”. (4) Clause (2) (0.a) is revoked on May 6, 2008. 24.1.09.1 (1) This rule (rule 24.1.09.1) applies to actions governed by Rule 78 (Toronto Civil Case Management Pilot Project). 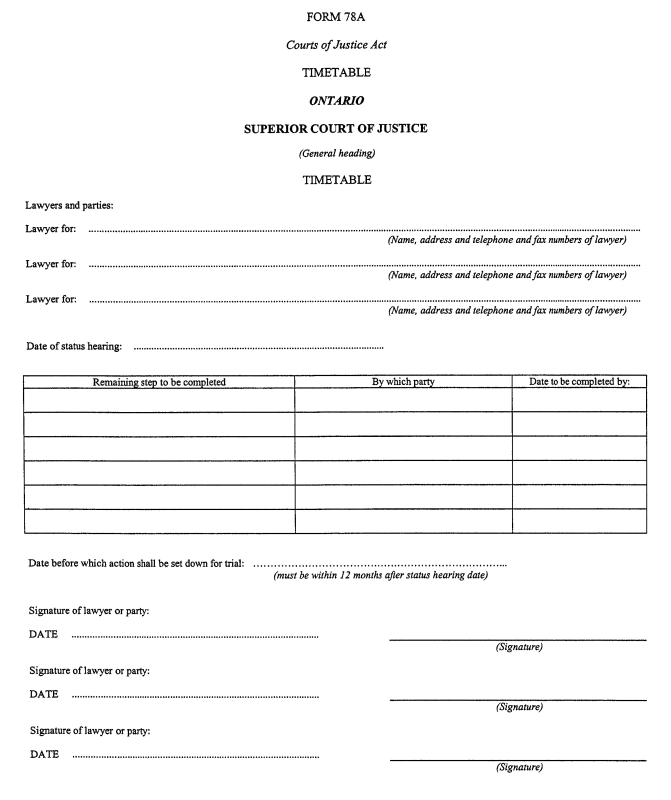 (c) in the case of any other action, a mediation session shall take place at the stage at which the parties agree that mediation is most likely to be effective, but in any case within 90 days after the action is set down for trial, unless the court orders otherwise, and the plaintiff shall file the notice described in subrule 24.1.09 (5) at least 30 days before the date of the mediation session. (3) This rule (rule 24.1.09.1) is revoked on May 6, 2008. (3.1) Clause (3) (a.1) is revoked on May 6, 2008. (1.2) This Rule also applies to an action that is assigned, under rule 78.12, to case management in accordance with this Rule. (1.3) Subrule (1.2) is revoked on May 6, 2008. (2) Clauses 77.01 (2) (a), (b), (d.0.4) and (d.0.5) of the Regulation are revoked. (1.3) For greater certainty, subrule (1.1) does not apply to an action that is governed by Rule 78. (1.4) Subrule (1.3) is revoked on May 6, 2008. (11) Subrules (1) to (10) do not apply to actions commenced in the City of Toronto, which shall, instead, be set down for trial under Rule 48. (12) Subrule (11) is revoked on May 6, 2008. 78.01 (1) This Rule applies to actions commenced in the City of Toronto on or after December 31, 2004. (g) actions certified as class proceedings under the Class Proceedings Act, 1992. (3) This Rule applies to an action commenced under the Class Proceedings Act, 1992 only if certification as a class proceeding has been denied. (4) In the event of conflict between a provision of Rules 1 to 77 and a provision of this Rule, this Rule prevails. 78.02 The purpose of this Rule is to establish a pilot project under which the parties will have the greater responsibility for managing actions commenced in the City of Toronto and moving them to trial or other resolution, and the court will provide partial or full case management for such actions only where a need for the court’s intervention is demonstrated. (e) make orders, impose terms, give directions and award costs as necessary to carry out the purpose of this Rule. (c) to preside and make orders at a pre-trial conference that are within the jurisdiction of a case management master. 78.05 (1) Third and subsequent party claims shall be given the same file number as the main action, followed by a suffix letter. (2) The form prescribed in this Rule and notices, certificates and orders referred to in it may be single spaced and need not have a backsheet. 1. More than two years have passed since the date the originating process was issued. 4. The action has not been set down for trial or summary trial. 5. The registrar has given 45 days notice that the action will be dismissed as abandoned. (2) The registrar shall serve a copy of the order made under subrule (1) on the parties. (3) The dismissal of an action as abandoned has the same effect as a dismissal for delay under rule 24.05. (c) make such other order as is just. 78.08 (1) If a status hearing has been requested under subrule 48.14 (5) and a party files the documents described in subrule (2) at least seven days before the date of the hearing, the hearing shall be held in writing and without the attendance of the parties, despite anything in rule 48.14, unless the court orders otherwise. 1. A timetable (Form 78A), signed by all the parties. 2. A draft order establishing the timetable. (c) show a date, which shall be no more than 12 months after the date of the status hearing, before which the action shall be set down for trial. (e) make an order under rule 78.12 (assignment to case management under Rule 77). 78.10 (1) After an action is set down for trial, the registrar shall give the parties 90 days notice to appear before a judge or case management master for a pre-trial conference under Rule 50. 1. The nature of the case. 2. The issues raised and the party’s position. 3. The names of the witnesses that the party is likely to call at the trial. 4. The steps that need to be completed before the action is ready for trial. (c) setting out any other matter relevant to scheduling the trial. (5) A copy of the pre-trial conference report shall be placed with the trial record. 1. Each lawyer who represents a party. 2. Each party who is not represented by a lawyer. (b) the obligation to be ready to proceed on the date fixed for the trial. 78.11 (1) A timetable that is established under this Rule by order of a judge or case management master may be amended by the parties, by a written agreement, unless the order expressly prohibits amendment. (2) An agreement to amend a timetable established under rule 78.08 shall not amend the date before which the action shall be set down for trial. 78.12 (1) If all the parties consent in writing, a judge or case management master may, on a party’s motion, assign one or more actions to case management in accordance with Rule 77. (b) a bound and tabbed copy of all the pleadings. (3) The judge or case management master may, on a party’s motion or on his or her own initiative, assign one or more actions to case management in accordance with Rule 77 if a party has taken steps that amount to chronic and substantial obstruction of the action, in the case of a single action, or of one or more actions, in the case of two or more. (4) In considering whether to assign an action to case management under subrule (1) or (3), the judge or case management master shall have regard to all the relevant circumstances, including the criteria set out in subrule 77.09.1 (5). (5) When an action is assigned to case management in accordance with Rule 77 under subrule (1) or (3), that Rule applies to the action with necessary modifications, and the judge or case management master may include any necessary directions in the order. (b) make such other order as is just. 78.13 The regional senior judge for the Toronto Region shall appoint an advisory committee composed of such members of the bench, the bar and the public and such employees of the Ministry of the Attorney General as are necessary to monitor and evaluate the operation of this Rule. 78.14 This Rule is revoked on May 6, 2008.